Property 5: Mid-Century Modern home in Manville Heights. Property 14: North Liberty Home on Iowa River w/ Fire Pit! 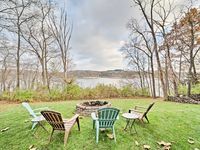 Property 15: Lake MacBride Cabin- State Park! Book 2 nights, get 3rd free! 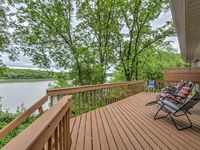 Property 16: North Liberty House on Coralville Lake near Dock! Tipi camping, private pond, hammock, trails on 4 acre private site. Property 17: Tipi camping, private pond, hammock, trails on 4 acre private site. Charming Bungalow in Czech Village/New Bo, close to Downtown. King Bed! We booked the cabin for the weekend to see our daughter who is a student at the University of Iowa. All together there were 5 of us there and we all loved it. We were able to hangout together, cook, watch tv/movies &amp; play games. The cabin is very nice, very clean as well. The view of the Iowa River is great, very relaxing to sit on the deck and take it all in. We will book it again for future visits.